What's cooking? Recipes for play! Play is messy, squishy, noisy, and fun! At LEAP, we are always cooking up new recipes for memorable and valuable play. Sometimes we fail… something that sounded easy and fun turns into a disaster. Sometimes we succeed and get to enjoy seeing LEAPers interact with our creations! This week, we are going to share some of our favorite recipes for play. All of these recipes use ingredients and materials that can be found at home or easily at the store - so jump in! Try something new and let us know how it goes! This play dough was created using an easy no-bake process. It lasts long if stored in an airtight container, but can also be left out to harden. The provided recipe creates the perfect amount of clay for one toddler. At LEAP, we multiplied this recipe by 6 so many LEAPers could play together. Combine the ingredients in a bowl and mix well. Knead the mixture with your hands for 2-3 minutes (Consider it your arm workout!). Wash and dry your hands, then add more flour if the dough is too sticky. This paint goes on smooth and dries puffy, creating the perfect arctic design! You can play around with scents and colors, too. Mix equal parts glue and shaving cream, and stir well. Paint! You can use paintbrushes, cotton balls, feathers, your fingers, whatever you imagine! With its bright colors and unique texture, chalk is always fun! Now imagine spraying chalk to create different designs. That’s what we do at LEAP! Find a spray or squirt bottle to use for this fun twist on a classic play activity. Liquid washable water colors – won’t stain clothes or sidewalks! Add the corn starch to your spray bottle, then fill with water. Add water colors to create your desired hue. 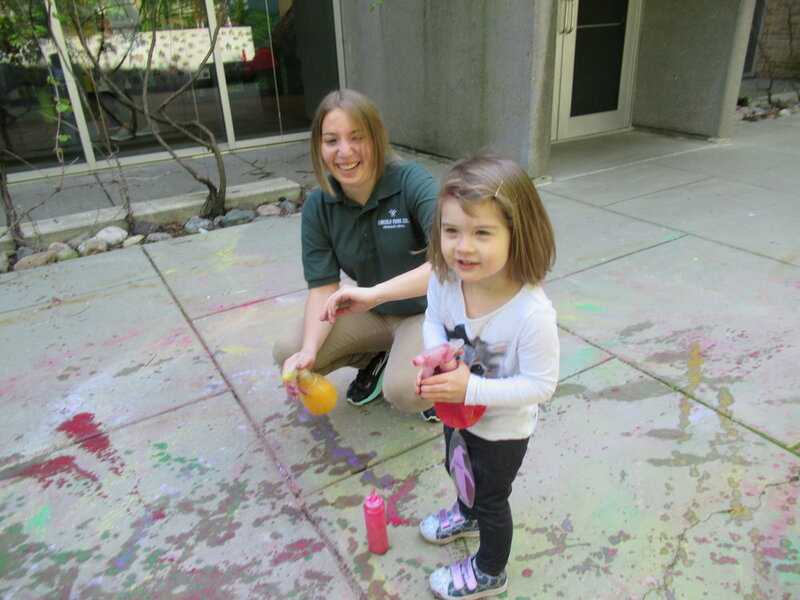 BONUS: For extra fun, squirt or spray vinegar onto your chalk drawings to watch your art bubble and erupt! Sand is a wonderful sensory experience no matter the texture. It reminds us of walking on the beach or digging in the sandbox with friends. Kinetic, or moldable, sand is one of our favorite sensory materials. It feels familiar like sand, but can be shaped and re-molded over and over! The below recipe creates 6 cups of kinetic sand. 2 tsp dish soap - Hint! Choose a dish soap with a fragrance you like. Choose an airtight container to keep your sand. This will be where you mix! Add the play sand and corn starch to your container, and mix well. Add your dish soap/water mixture to your sand/corn starch container, and (you guessed it!) mix well. If the sand feels too dry, slowly add more water until it feels moldable enough. Seal it up when you’re finished to reuse over and over. If it feels to dry, add more water. If it doesn’t feel “squishy” enough, add another squirt of dish soap. These are just a few of the many play activities you’ll see or have seen at LEAP. We love searching for new play recipes and fiddling around with them to make them our own. Adding ingredients and changing textures adds to the play experience for us – we definitely recommend putting your own spin on these recipes! One of our favorite places to start is a blog called “Growing A Jeweled Rose.” Here you can find over 100 play recipes, ranging from easy-peasy to heavy duty. What have you cooked up lately? We’d love to hear about it!